Roy Lichtenstein, Girl in Mirror, 1964. A few days ago I found out that at Phillips in Antwerp (Belgium) a work of Roy Lichtenstein was passing through on its way to Londen for the 20th century & contemporary art evening sale. I had to see this work before it disappears again in a private collection. Standing before the Girl in Mirror I felt immediately a friendship between me and this work. It’s a beauty! Also because of the many favorable internal and external factors that may influence value and probably the result at the auction. The subjects, the blonde heroin, the ideal of American beauty in movies and comics, and the mirror made it an iconic Pop art work. 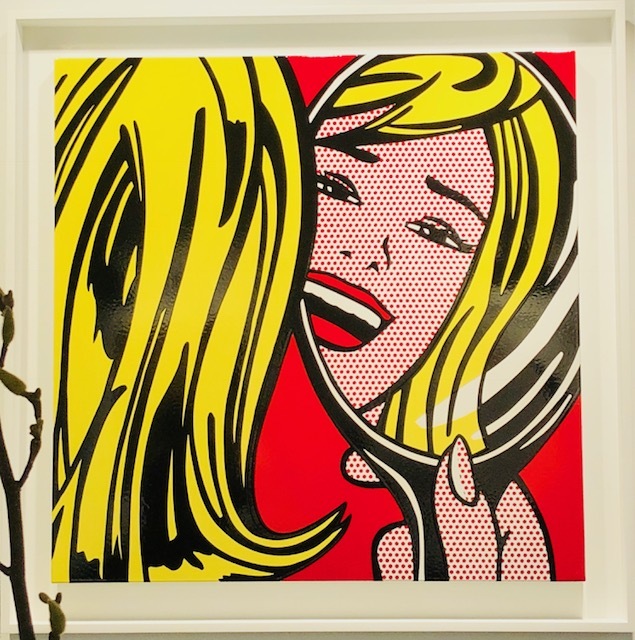 Executed in the characteristic Ben-Day dots, a nod to the mass-produced images of comic books makes it a fully recognizable work of Lichtenstein. The dream girl, looking in the mirror for any trace of flaws, depict the ideal of mass consumer culture presented back unto itself. A mirror image of popular culture that reflects the new importance of signs of commerce. Painted in 1964, the year wherein Lichtenstein reached the peak of his technical craftsmanship at such level that this serie of the comic strip paintings were the launch of an international career. By using porcelain enamel on steel the painting gets a shining glow. It attains a perfection in lines and color by using a medium that achieves a clean and smooth surface. Because this painting is number three of a limited edition of eight and the current popularity of Post-War and Contemporary art, we can imagine it will be wanted. The work is signed, dated and numbered “rf Lichtenstein 3/8 1964” on the reverse and included in the catalogue raisonné of the Roy Lichtenstein Foundation. Girl in Mirror has an excellent provenance, starting at the Leo Castelli Gallery followed by two significant collections. At first the collection of Charles H.Carpenter, a lifelong collector of Post War artists and until 2010 as part of the collection of Max Palevsky, a venture capitalist. After his death in 2010, 250 artworks were sold at Christie’s for the total amount of $272 million. Girl in Mirror was sold for $4.898.500 to the current owner. It has been extensively exhibited worldwide and incorporated in literature. Recognized as an iconic work much information is available online. At the auction house in Antwerp they marked the perfect condition of the work, confirmed in the condition report. The combination of these favorable factors makes it a gem. Looking forward to the auction on 7th March. Comment by Emily Thompson, instructor for Sotheby’s Institute of Art She has over 18 years of experience appraising fine art, with specializations including Post-War and Contemporary; Impressionist and Modern Paintings, Drawings, and Sculpture. 19th Century European Paintings, American Paintings, Drawings, and Sculpture and Vintage Posters. Ms. Thompson has valued thousands of artworks for purposes including charitable contribution, estate tax, collateral loan valuation and equitable distribution as a senior fine art appraiser at international appraisal firms including Gurr Johns, Int. and as Fine Art Specialist at Emigrant Bank Fine Art Finance and its subsidiary art advisory firm, Fine Art Asset Management, LLC. At Fine Art Asset Management, Ms. Thompson routinely works with collectors and their fiduciaries to generate USPAP compliant appraisal documents for submission to the IRS. Fantastisch voor jou dat je dit werk hier in Antwerpen met eigen ogen hebt kunnen bewonderen voor het in een privé collectie terecht komt …i nderdaad een kans die je niet mocht laten liggen. Dankzij jouw eerder artikel “Art follows the money” ben ik helemaal mee!